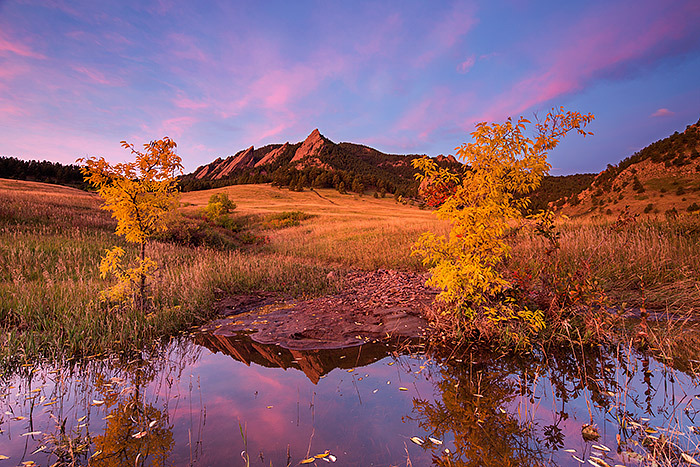 Pastel hue's light the skies over Boulder and the Flatiron formation on a spectacular autumn morning in Chautauqua Park. The Flatirons reflect in a small pond that has formed from recent rains and the trees on each side of this small but beautiful pond in Chautauqua Meadow frame the reflection of the Flatirons perfectly. Photo © copyright by Thomas Mangan.